True hands-free with easy streaming and rechargeable options – the Moxi All has it all! “Convenient” and “hearing aids” are normally not two words you would hear together. But the new Moxi™ All from Unitron packs a lot of punch for a small RIC style hearing aid. The Moxi All is truly hands-free when streaming phone calls from your mobile phone. In the past “hands-free” wasn’t really hands-free. While sound would stream to your hearing aid from your phone you still had to hold your phone to use the phone’s microphone if you wanted to actually say anything to the other party. No more. The Moxi All has two-way streaming for phone calls meaning sound and voice travel between your hearing aid and your phone. Your phone could be in your bag or pocket and you simply take the call by pressing the button on the right hearing aid or dismiss it by pressing the left one. Your hearing aid now works just like a normal Bluetooth wireless headset. 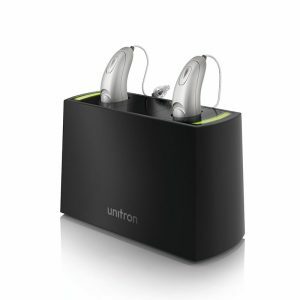 The Moxi All connects easily to the optional Unitron TV Connector, which means you can get quality, stereo sound streamed to both ears from any device that uses an optical or 3.5mm stereo plug such as your computer, tablet or stereo. Your Moxi Alls become your own personalised headphones. Need to turn the volume up or down? Use the Remote Plus app on your phone to manage the volume from the connected sound source without affecting the volume in the room. If you choose to you can make your Moxi All hearing aids rechargeable. With a simple add on kit you get a full day’s listening from a simple overnight recharge. Just put your hearing aids in the tiny charger when you go to bed and they are ready to go for you in the morning. Should your hearing needs or lifestyle change rest assured that your future needs are covered. 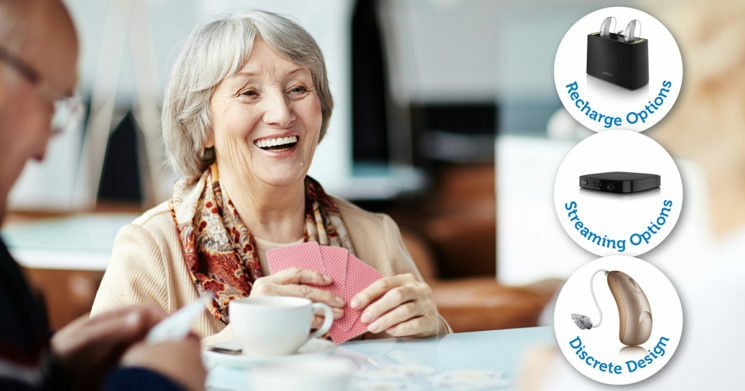 With Unitron’s Flex:upgrade program you can easily upgrade the features of your Moxi All hearing aids without having to buy new hearing aids. 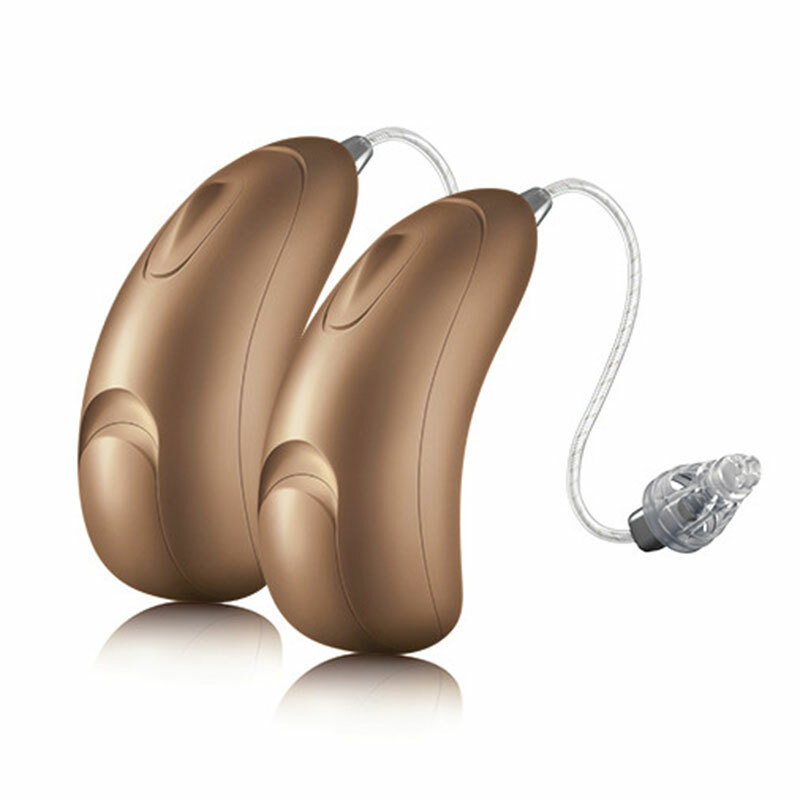 The Moxi All hearing aids are incredible value for the technology and options built-in. The Moxi All starts at just $200 a pair for eligible pensioners and veterans. This includes your two Moxi All hearing aids and all assessment, fitting, follow-up and tuning appointments. You also get the Flex:upgrade functionality so you can upgrade the features in your hearing aids when you want or need to without spending money on a whole new set. For privately funded patients, the Moxi All starts at just $2,190 a pair plus $300 assessment and fitting by Clarity’s expert audiologists. You may also be eligible for a rebate from your private health insurance. This also includes Moxi All’s Flex:upgrade functionality allowing you to upgrade to the next level of features in the future without having to replace your hearing aids. The Unitron TV Connector is $250. The Moxi All Recharge Kit is $395 and will charge a pair of Moxi All hearing aids overnight. Call Clarity today on 1300 252 748, or submit a request for an appointment or more information using our online form. Click the button below. You can get the Moxi All hearing aids at Townsville, Mackay, Brisbane or any of our visiting clinics. Why choose Clarity for your hearing loss treatment? Accurate diagnosis: We only employ the best University Masters qualified and registered Audiologists and we take the time to ensure we accurately diagnose your hearing loss through a comprehensive hearing assessment, not just a hearing screen. Ethical and transparent pricing: Our margins are the same across our entire range of hearing aids. This ensures there is no incentive to over-prescribe technology other than what is best for you. We earn our income from our clinical time ‘ our expertise ‘ not from selling hearing aids. This also means our hearing aid pricing is some of the cheapest available at close to wholesale prices. No sales commissions: With no sales commissions or sales targets our audiologists can focus on treating your hearing loss, not selling you a hearing aid. Independent since 2008: Being independent we can provide hearing aids and implants from all manufacturers to ensure you get the one right for your hearing needs. We will offer you a choice of options at different price points that will treat your hearing loss and we will take the time to explain the benefits and features of each option.